Team Scores – 1) Gihon 36, 2) Jefferson 34, 3) Madison 28, 4) Mineral Wells 19, 5) Criss and Greenmont 16, 7) Vienna and Emerson 14, 9) Kanawha 11, 10) Worthington 10, 11) Blennerhassett 9, 12) Frankli n4, 13) Williamstown and McKinley 2, 15) Martin and Fairplains 1. 100 - 1, Daysha Hastings, (JE), 14.48. 2, Jerircia Jackson-Terrell, (EM), 15.03. 3, Payten Mackey, (GI), 15.63. 4, Lillian Burrows, (MD), 15.71. 5, Kymani Prince, (FR), 15.74. 6, Ashley Reaser, (KA), 15.95. 200 - 1, Brooklyn Curry, (CR), 32.59. 2, Abby Starkey, (GI), 32.60. 3, Kylee Maggiacomo, (GR), 32.86. 4, Lakin Barker, (JE), 34.28. 5, Katelyn Thorn, (VI), 34.31. 6, Corell Reck, (WI), 34.86. 400 - 1, Jaclynne Welch, (KA), 1:12.55. 2, Anna Floyd, (GR), 1:14.91. 3, Bella Woods, (VI), 1:19.47. 4, Azzerayaah Skiles, (WO), 1:19.79. 5, Makayla House, (MD), 1:21.87. 6, Lucie Cline, (MR), 1:22.41. 4x100 Relay - 1, Jefferson (Lakin Barker, Daysha Hastings, Emily Woisenski, Adrianna Joy), 1:04.00. 2, Gihon (Abby Starkey, Izzy Deguzman, Alyssa VanFossen, Payten Mackey), 1:04.22. 3, Vienna (Katelyn Thorn, Leila Noland, Hayden Carey, Bella Woods), 1:06.11. 4, Madison (Nedia Cremeans, Kennedy Porter, Makayla House, Lillian Burrows), 1:06.56. 5, Criss (Rylee Lamp, Layla McDonald, Sophia Isaacs, Brooklyn Curry), 1:07.32. 6, Blennerhassett (Anniya Powell, Kaitlyn McCartney, Isabel Hardy, Caitlyn Headlee), 1:08.58. Long Jump - 1, Daysha Hastings, (JE), 6-09.50. 2, Nedia Cremeans, (MD), 6-06.50. 3, Jerircia Jackson-Terrell, (EM), 6-06. 4, Izzy Deguzman, (GI), J6-06. 5, Mya Baruwa, (FR), J6-06. 6, Reagan Ward, (MW), 6-05.50. 7, Baylee Bostaph, (VI), 6-05. Softball Throw - 1, Payten Mackey, (GI), 138-07. 2, Allison Asbury, (MW), 135-01. 3, Krista Durkin, (WO), 104-08. 4, Kennedy Porter, (MD), 103-04. 5, Kylee Maggiacomo, (GR), 98-10. 6, Reagan Corbett, (WI), 97-02. Team Scores – 1) Mineral Wells 42, 2) Lubeck 33, 3) Blennerhassett 32, 4) Waverly 22, 5) Neale 19, 6) Williamstown 18, 7) Madison and Jefferson 11, 9) Vienna 8, 10) Emerson 7, 11) Greenmont and Kanawha 4, 13) Martin and McKinley 2, 15) Worthington and Criss 1. 100 - 1, Jackson Kerr, (WA), 14.96. 2, Chase Offenberger, (MW), 15.12. 3, Ryder Springston, (BL), 15.17. 4, Bo Moellendick, (VI), 15.18. 5, Grant McDermott, (WI), 15.53. 6, Jordan Foster, (LU), 15.55. 200 - 1, Harry Silvis, (BL), 31.56. 2, Wyatt Powell, (WI), 31.79. 3, Austin Perry, (MW), 31.94. 4, Craig Deem, (LU), 32.47. 5, Ben Chichester, (NE), 32.55. 6, Jacobi White, (CR), 33.58. 400 - 1, Landen Deuley, (NE), 1:08.79. 2, Wyatt Powell, (WI), 1:10.59. 3, Jackson Kerr, (WA), 1:10.65. 4, Bo Moellendick, (VI), 1:11.11. 5, Ethan Jones, (MC), 1:13.18. 6, Sylas Cheuvront, (EM), 1:13.74. 800 - 1, Jordan Foster, (LU), 2:46.23. 2, Dre Bedgood, (MD), 2:46.56. 3, Chase Offenberger, (MW), 2:50.44. 4, Toby Thompson, (GR), 2:51.27. 5, Jase Rake, (MR), 2:56.88. 6, Dylan Burdette, (NE), 2:58.79. 4x100 Relay - 1, Mineral Wells (Kolten Persinger, Austin Perry, Xavier St. Andry, Daiten Roberts), 1:02.45. 2, Blennerhassett (Harry Silvis, Braxton Byrd, Ryder Springston, Aiden Nicholson), 1:02.68. 3, Emerson (Sylas Cheuvront, Evan Carte, Quantrell Webb, Cole Hicks), 1:04.06. 4, Lubeck (Oliver Dean, Derek Sandy, Cade Staats, Corbin Phillips), 1:04.11. 5, Madison (Ricardo Salazar, Seth Henderson, Dominic Way, Ben Morris), 1:04.41. 6, Jefferson (Braden Keffer, Kris Stevens, Dylan Fuller, Chance Kirgis), 1:06.01. Long Jump - 1, Chance Kirgis, (JE), 7-01. 2, Jordan Foster, (LU), 6-11. 3, Jackson Kerr, (WA), J6-11. 4, Dylan Burdette, (NE), 6-09. 5, Austin Perry, (MW), 6-08.50. 6, Ricardo Salazar, (MD), 6-07. Softball Throw - 1, Taj Joyce, (MW), 148-08. 2, Harry Silvis, (BL), 147-09. 3, Easton Walker, (LU), 131-08. 4, Zane Kirk, (KA), 125-04. 5, Hyland Garvey, (NE), 123-05. 6, Collin Hayes, (WO), 122-09. Team Scores – 1) Vienna & Lubeck 22, 3) Kanawha, Worthington & Blennerhassett 18, 6) Gihon 16, 7) Williamstown 15, 8) Greenmont 11, 9) McKinley 6, 10) Neale 4, 211) Mineral Wells 3, 12) Madison 2. Team: 1, Kanawha 18-1 (Akira Edison, Rylie Stull, Patience Randolph). 2, Blennerhassett 17-9.5. 3, Williamstown 17-3. 4, Lubeck 17-2. 5, Gihon 16-7. 6, Madison 16-2.5. Individual: 1, Akira Edison, (KA), 6-09.50. 2, Ava VanDyke, (BL), 6-08. 3, Sydney Anderson, (WI), 6-04. 4, Emily Bell, (WI), 6-01. 4, Addison White, (LU), 6-01. 4, Kailynn Walker, (GI), 6-01. Team: 1, Gihon 269-8 (Payton Mackey, Brylee Hatcher, Taylor Benear). 2, Vienna 254-7. 3, Kanawha 245-10. 4, Blennerhassett 244-11. 5, Neale 241-4. 6, Mineral Wells 234-2. Individual: 1, Jillian Nay, (NE), 135-07. 2, Payton Mackey, (GI), 112-05. 3, Emma Kiger, (VI), 106-11. 4, Natalie Jones, (GR), 106-03. 5, Brylee Hatcher, (GI), 105-10. 6, Brooklyn Griffin, (MW), 103-06. White), 1:05.81. 3, McKinley (Annie Collins, Suzie Lyons, Sophia Beam, Jordan Adams), 1:06.32. 4, Gihon (Olivia Martin, Payton Mackey, Kailynn Walker, Addison Jackson), 1:07.17. 5, Mineral Wells (Farrah Yost, Emma Kuhl, Presley Amos, Brylee Ferguson), 1:07.31. 6, Greenmont (Ella Heldman, Hildie Rummer, Caroline Kammerer, Natalie Jones), 1:09.99. 1, Greenmont (Anna Floyd, Margaret Mildren, Thea Bordeaux, Peyton Louden), 2:20.77. 2, Williamstown (Daphne Cockerham, Izzy Zide, Ava Lightfritz, Gabriella Seese), 2:20.86. 3, Lubeck (Della Mathers, Kennedy Mays, Danielle Johnson, Emilee Moyers), 2:23.29. 4, Vienna (Layla Jackson, Izzy King, Izzy Blair, Lily Farinash), 2:25.15. 5, Kanawha (Rylie Stull, Jaclynne Welch, Samantha Varner, Gracyn Miskofsky), 2:25.98. 6, Madison (Lilly Latham, Michaela House, Tyra Green, Cali Way), 2:27.59. 1, Vienna (Makenna Keefer, Leia Noland, Kylee Maggiacomo, Jadyn Colgrove), 2:25.19. 2, Worthington (Kearsten Alfred, Maddison Kincaid, Bryce Smith, Ellie Hines), 2:27.91. 3, Blennerhassett (Kyialyn Wilkening, Olivia Henderson, Ava VanDyke, Anniya Powell), 2:30.10. 4, Lubeck (Madelyn Monroe, Emilee Moyers, Danielle Johnson, Addison White), 2:32.14. 5, Neale (Kaysis Smith, Mollie Whitecotton, Katie Rutherford, Jillian Nay), 2:33.27. 6, Williamstown (Olivia Bayer, Alyssa Sauro, Lexi Wynn, Remy Lefubure), 2:33.95. Team Scores – 1) Mineral Wells 40, 2) Greenmont 22.3, 3) Gihon 18, 4) Neale 17, 5) Worthington 12, 6) Williamstown 11, 7) Madison 8.3, 8) Fairplains 7, 9) Blennerhassett 6, 10) Lubeck 4.3, 11) Parkersburg Catholic 4, 12) Vienna 3, 13) Emerson 2. Team: 1, Mineral Wells 15-6 (Mary Stout, Maci Forshey, Reagan Ward). 2, Neale & Williamstown 14-9.5. 4, Worthington & Vienna 14-5. 6, Lubeck, Madison & Greenmont 13-10. Individual: 1, Mya Baruwa, (NE), 5-10. 2, Izzy Deguzman, (GI), 5-08.50. 3, Mary Stout, (MW), 5-08. 4, Baylee Bostaph, (VI), 5-07.50. 5, Bella Taylor, (PC), 5-05. 5, Corell Reck, (WI), 5-05. Team: 1, Mineral Wells 289-8 (Allison Asbury, Jaiden Vargas, Auyner Joyce). 2, Greenmont 204-1. 3, Madison 190-2. 4, Park. Catholic 180-11. 5, Kanawha 178-10. 6, Neale 171-9. 1, Allison Asbury, (MW), 108-01. 2, Jaiden Vargas, (MW), 97-11. 3, Auyner Joyce, (MW), 83-08. 4, Lillie Hamilton, (LU), 77-04. 5, Frances Guice, (PC), 77-03. 6, Aubrey Welch, (MD), 75-03. 1:09.24. 2, Worthington (Sophia Corbin, Sidney Cool, Allison Hayes, Azzerayah Skiles), 1:10.89. 3, Greenmont (Carly Bloomingdale, Alexa Maher, Camille Tatterson, Kendall Kimes), 1:12.32. 4, Gihon (Abby Starkey, Addy Fluharty, Izzy Deguzman, Alyssa Vanfossen), 1:12.78. 5, Lubeck (Gemma Davies, Alivia Goff, Olivia Deuley, Allison Curfman), 1:13.13. 6, Emerson (Lauren Flanagan, Emma Miller, Audrey Wagoner, Alayna Davis), 1:13.50. 1, Gihon (Emma Ryen, Taylor Benear, Alyssa Vanfossen, Addy Fluharty), 2:36.62. 2, Greenmont (Faithlyn Butcher, Alexa Maher, Carly Bloomingdale, Olivia Eakle), 2:36.72. 3, Blennerhassett (Abby Menges, Camryn McLain, Madison Wright, Amiya Powell), 2:42.89. 4, Williamstown (Makaela Bandy, Kaylyn Emigh, Corell Reck, Gracie Montgomery), 2:43.88. 5, Lubeck (Lillie Hamilton, Alivia Goff, Olivia Deuley, Allison Curfman), 2:44.21. 6, Fairplains (Laiken Byers, Mia Nault, Harleigh Godfrey, Jade Neff), 2:44.24. 1, Mineral Wells (Maci Forshey, Reagan Ward, Auyner Joyce, Mary Stout), 2:42.96. 2, Neale (Lillian Inghram, Saige Ashcroft, Gracie Duncan, Adilynn Deuley), 2:43.27. 3, Fairplains (Laiken Byers, Mia Nault, Jasmine Haddox, Jade Neff), 2:44.82. 4, Gihon (Abby Starkey, Izzy Deguzman, Emma Ryen, Taylor Benear), 2:45.82. 5, Madison (Aislin White, Judith Munoz, Chloe Mulligan, Brennan Harvey), 2:46.95. 6, Emerson 2:47.25. Team Scores – 1) Mineral Wells 28, 2) Emerson 20, 3) Gihon and Lubeck 18, 5) Madison 15, 6) Neale 14, 7) Kanawha 13, 8) Vienna and Worthington 7, 10) Williamstown 6, 11) Greenmont and Criss 4, 13) Parkersburg Catholic 1. Team Scores – 1) Lubeck 40, 2) Vienna 23, 3) Mineral Wells 22.5, 4) Madison 22, 5) Neale 15, 6) Williamstown and Emerson 10, 8) Criss and Martin 4, 10) Parkersburg Catholic 2, 11) Kanawha and Greenmont 1, 13) Fairplains 0.5. Team: 1) Emerson (Ty Street, Ethan DelaCruz, Quinton Wright) 17-11.24, 2) Mineral Wells 17-1.5, 3) Kanawha 16-11.5, 4) Neale 16-5, 5) Vienna 15-11.5, 6) Greenmont 15-8. 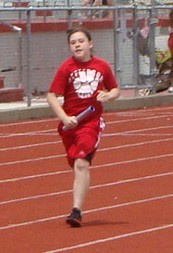 Individual: 1, Zane Lewis, (KA), 6-06. 2, Austin Conley, (MW), 6-01. 2, Blake Riggs, (VI), 6-01. 4, Jackson Wharton, (GR), 6-00. 4, Ty Street, (EM), 6-00. 4, Ethan DelaCruz, (EM), 6-00. Team: 1) Emerson (Brantley Wagoner, Evan Carte, Cole Hicks) 16-3.5, 2) Vienna 15-6.5, 3) Lubeck 15-2, 4) Neale 14-10.5, 5) Martin 14-7.5, 6) Fairplains and Mineral Wells 13-10. Individual: 1, Brayden Thorn, (VI), 5-11.50. 2, Brantley Wagoner, (EM), 5-09.50. 3, Landen Deuley, (NE), 5-07. 4, Coleton Hill, (MR), 5-05.50. 5, Tre Fox, (KA), 5-05. 6, Evan Carte, (EM), 5-04. Team: 1) Gihon (Cam Fallon, T.J. Thomas, Kaeden Sees) 363-7, 2) Lubeck 351-4, 3) Vienna 338-9, 4) Mineral Wells 330-8, 5) Madison 327-6, 6) Park. Catholic 320-5. Individual: 1, Cam Fallon, (GI), 132-11. 2, T.J. Thomas, (GI), 131-06. 3, Aiden Cremeans, (MD), 130-07. 4, Cooper Cancade, (VI), 130-05. 5, Evan Hamrick, (LU), 125-09. 6, Landyn Summers, (NC), 122-08. Team: 1) Vienna (Braxton Kupfner, Brayden Thorn, Tanner Cancade) 312-11, 2) Lubeck 310-6, 3) Mineral Wells 306-9, 4) Madison 303-0, 5) Criss 280-8, 6) Kanawha 246-4. Individual: 1, Xavier St. Andry, (MW), 115-00. 2, Dominic Way, (MD), 111-05. 3, Daniel Kieran, (LU), 106-06. 4, Braxton Kupfner, (VI), 106-05. 5, Gavin Fling, (LU), 105-07. 6, Peyton Cline, (MW), 105-03. 1, Lubeck (Coen Daniel, Kieran Daniel, Gavin Fling, Craig Deem), 2:22.26. 2, Madison (Dominic Way, Cameron Hemingway, Lyndyn Ervin, Dre Bedgood), 2:31.24. 3, Williamstown (Christian Lockhart, Zander Boyce, Tyler Newlon, Brenden Westbrook), 2:39.25. 4, Vienna (Branson Lott, Connor George, Tanner Cancade, Brock Gilliespie), 2:39.71. 5, Criss (Connor Roberts, Brandon Townsend, Kaden Boice, Linkin Seevers), 2:39.97. 6, Neale (Aiden Reynolds, Levi Morr, Triston Cayton, Jordan Hess), 2:42.44. 1, Madison (Luke Davis, Ricardo Salazar, Greyson Booth, Aiden Cremeans), 2:19.54. 2, Neale (Chaz Elam, Christian Rutherford, Thaddeus Trent, Andrew Rickman), 2:19.76. 3, Lubeck 'B' (Kyle Cox, Logan Fling, Wyatt Curfman, Noah Dulaney), 2:19.82. 4, Lubeck (Aeneas Lauderman, Ramario Adams, Isaac Osborn, Derek Sandy), 2:20.79. 5, Kanawha (Zane Lewis, Tony Herrera, Payton Johnson, Ethan Ahart), 2:23.15. 6, Vienna (Blake Riggs, Cooper Cancade, Noah Frazier, Lucas Horner), 2:23.68. 1, Lubeck (Cade Staats, Gavin Fling, Jordan Dearth, Craig Deem), 1:07.99. 2, Mineral Wells (Peyton Cline, Lincoln Agnew, Xavier St. Andry, Chase Goebel), 1:10.22. 3, Madison (Cameron Hemingway, Austin Jones, Ishawn Myers, Cole Dennison), 1:12.50. 4, Williamstown (Brenden Westbrook, Tyler Newlon, Zander Boyce,), 1:14.03. 5, Parkersburg Catholic (A.J. Payne, Gabe Rice, Conner Zecca, Carter Nelson), 1:14.13. 6, Greenmont (Jack Louden, Cale Varney, Collin Moore, Seita Tooyama), 1:16.86. 1, Mineral Wells (Austin Conley, Bryce Smedley, Taj Joyce, Austin Perry), 1:04.80. 2, Gihon (Landon Utt, T.J. Thomas, Cam Fallon, Ethan Sands), 1:06.78. 3, Worthington (Caleb Lindenmuth, Collin Hayes, Jay Bowling, Landon Edwards), 1:06.85. 4, Criss (Connor Roberts, Adam Elder, Logan Poling, Jacobi White), 1:07.14. 5, Emerson (David Smith, Jacob Thomas, Quinton Wright, Ty Street), 1:08.27. 6, Kanawha (Gauge Delancey, Zane Lewis, Skylar Hutchinson, Isaac Dailey), 1:08.37. 1, Neale (McKendrick Allman, Rex Ashcroft, Ben Chichester, Landen Deuley), 2:27.62. 2, Mineral Wells (Peyton Cline, Lincoln Agnew, Xavier St. Andry, Asa Yost), 2:31.73. 3, Lubeck (Easton Walker, Corbin Phillips, Kieran Daniel, Jordan Dearth), 2:35.53. 4, Madison (Austin Jones, Dre Bedgood, Dominic Way, Lyndyn Ervin), 2:39.94. 5, Martin (Cole Smith, Jase Rake, Preston Heckert, Coleton Hill), 2:43.09. 6, Vienna (Brayden Thorn, Connor George, Branson Lott, Braxton Kupfner), 2:44.03. 1, Kanawha (Tony Herrera, Isaac Dailey, Preston Randolph, Zach Farnsworth), 2:21.98. 2, Emerson (Jacob Thomas, Ethan DelaCruz, Ty Street, Quinton Wright), 2:22.56. 3, Mineral Wells (Shawn Cross, Bryce Smedley, Taj Joyce, Austin Conley), 2:24.00. 4, Williamstown (Julian Johnson, Carter Montgomery, Rowan Cumberledge, Carson Hill), 2:24.12. 5, Madison (Zach Wigal, Ian Lemley, Aiden Cremeans, Luke Davis), 2:24.19. 6, Worthington (Caleb Lindenmuth, Jay Bowling, Collin Hayes, Landon Edwards), 2:29.65. 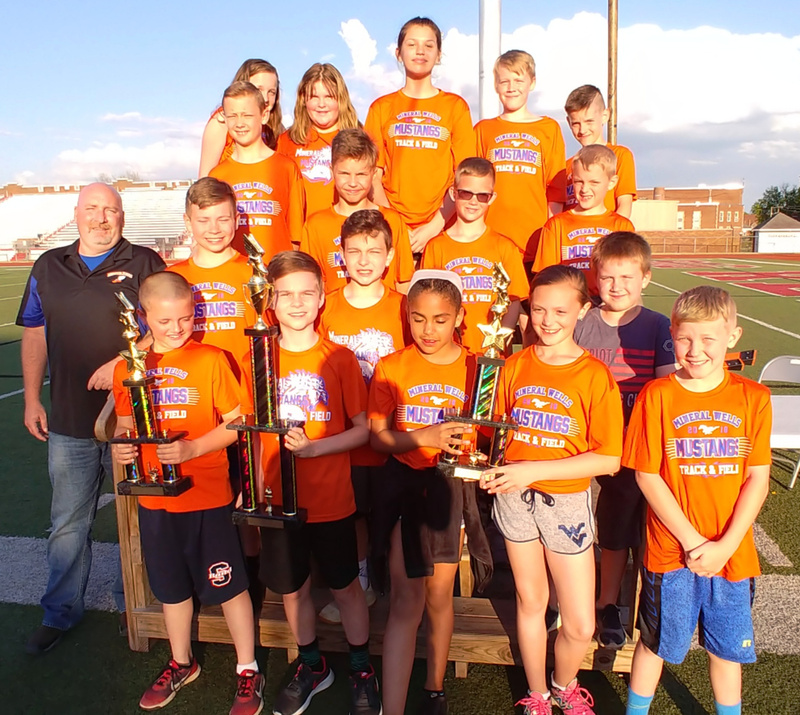 Two county meet records were broken during the 2018 Elementary Track Championships held Monday and Tuesday at Parkersburg’s Stadium Field. Jillian Nay of Neale eclipsed the 11-12 year-old girls softball throw mark with a toss of 141-feet-1. The old standard was 120-2 by Brionna Patterson of Gihon. Shelby Smith of Waverly ran a 1:09.2 to break the 11-12 year-old Girls 400 meter dash record of 1:10.3 set by Samara Nunn of Lubeck. Combined Team Scores – 1) Mineral Wells 119 OVERALL GRAND CHAMPION, 2) Lubeck 87, 3) Vienna 74, 4) Neale 73, 5) Williamstown 72, 6) Kanawha 65.5, 7) Jefferson 56, 8) Greenmont and Madison 52, 10) Blennerhassett 37, 11) Emerson 35.5, 12) Gihon 33, 13) Worthington 28, 14) Waverly 26, 15) Criss 22, 16) McKinley 15, 17) Martin 12, 18) North Christian 5, 19) Fairplains and Parkersburg Catholic 2. Girls Team Scores – 1) Mineral Wells 49, 2) Jefferson 48, 3) Greenmont 42, 4) Vienna 38, 5) Williamstown 33, 6) Neale 32, 7) Worthington 28, 8) Blennerhasett 27, 9) Gihon 25, 10) Lubeck 24, 11) Kanawha 22, 12) Emerson 20, 13) Waverly 16, 14) Madison 12, 15) McKinley and Criss 6, 17) Martin 4, 18) Fairplains 2. 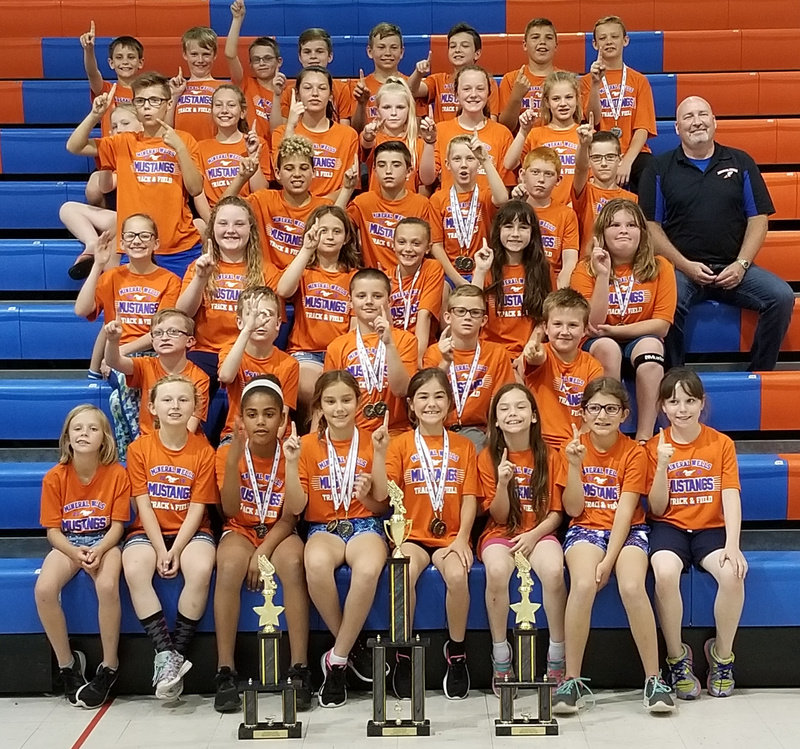 Boys Team Scores – 1) Mineral Wells 70, 2) Lubeck 63, 3) Kanawha 43.5, 4) Neale 41, 5) Madison 40, 6) Williamstown 39, 7) Vienna 36, 8) Criss 16, 9) Emerson 15.5, 10) Waverly, Blennerhassett and Greenmont 10, 13) McKinley 9, 14) Jefferson, Martin and Gihon 8, 17) North Christian 5, 18) Parkersburg Catholic 2. 50 Finals – 1, Lauren Flanagan (EM) 8.28. 2, Mary Stout (MW) 8.47. 3. Aislin White (MD) 8.50. 4, Ashley Reaser (A) 8.59. 5, Alivia Goff LU) 8.72. 6, Baylee Bostaph (VI) 9.02. Girls 100 - 1, Olivia Eakle, (GR), 16.28. 2, Alyssa Vanfossen, (GI), 16.54. 3, Katelyn Thorn, (VI), 16.58. 4, Jayda Wright, (JE), 16.60. 5, Emma Miller, (EM), 16.62. 6, Makaela Bandy, (WI), 16.78. Girls 200 - 1, Karma Hedges, (JE), 34.94. 2, Olivia Eakle, (GR), 35.09. 3, Katelyn Thorn, (VI), 35.28. 4, Correl Reck, (WI), 37.38. 5, Jade Neff, (FA), 37.97. 6, Reagan Ward, (MW), 38.00. Girls 200 - 1, Addison White, (LU), 30.83. 2, Kaelynn Hester, (JE), 31.47. 3, Bryce Smith, (WO), 31.50. 4, Suzie Lyons, (MC), 32.28. 5, Peyton Louden, (GR), 32.83. 6, Aleeta Ntow, (KA), 33.23. Girls 800 - 1, Alyssa Sauro, (WI), 2:53.53. 2, Peyton Louden, (GR), 2:58.71. 3, Ellie Hines, (WO), 3:02.13. 4, Jetta Wright, (MR), 3:03.09. 5, Anniya Powell, (BL), 3:04.29. 6, Jadyn Colgrove, (VI), 3:05.46. Boys 50 Finals – 1, Xavier St. Andry (MW) 8.07. 2, Brayden Thorn (VI) 8.10. 3, Jaxon Thomas (MC) 8.16. 4, Trent Lawrentz (NC)8.25. 5, Chandler Jackson (GR) 8.59. 6, Ben Chichester (NE) 8.64. Boys 200 - 1, Kieran Daniel, (LU), 32.29. 2, Daiten Roberts, (MW), 33.94. 3, Branson Lott, (VI), 34.57. 4, Tre Fox, (KA), 34.59. 5, Lyndyn Ervin, (MD), 34.69. 6, Zander Boyce, (WI), 35.81. 4x100 Relay - 1, Mineral Wells (Chase Offenberger, Peyton Cline, Xavier St. Andry, Lincoln Agnew), 1:05.71. 2, Williamstown (Tyler Newlon, Wyatt Powell, Aiden Meeks, Brenden Westbrook), 1:06.28. 3, Lubeck (Craig Deem, Jordan Dearth, Gavin Fling, Cade Staats), 1:06.50. 4, Neale (Ben Chichester, McKendrick Allman, Rex Ashcroft, Landen Deuley), 1:06.55. 5, Madison (Dre Bedgood, Austin Jones, Lyndyn Ervin, Cameron Hemingway), 1:08.94. 6, Vienna (Brayden Thorn, Braxton Kupfner, Connor George, Tanner Cancade), 1:09.32. Softball - 1, Braxton Kupfner, (VI), 116-00. 2, Dominic Way, (MD), 107-07. 3, Johnathan Kohler, (BL), 103-11. 4, Chandler Jackson, (GR), 103-00. 5, Daiten Roberts, (MW), 102-11. 6, Easton Walker, (LU), 101-04. Standing Jump - 1, Brayden Thorn, (VI), 6-05. 2, Tre Fox, (KA), 6-02.25. 3, Landen Deuley, (NE), 6-02. 4, Coleton Hill, (MR), 6-01. 5, Dominic Way, (MD), 5-10.75. 6, A.J. Hendershot, (JE), 5-10.50. 200 - 1, Aiden Cremeans, (MD), 32.03. 2, Noah Dulaney, (LU), 32.67. 3, Adam Elder, (CR), 32.87. 4, Bryce Smedley, (MW), 33.06. 5, Cruz Isaly, (PC), 33.73. 6, Devin Forshey, (GI), 34.09. 800 - 1, Zach Farnsworth, (KA), 2:41.46. 2, Nicholas Rowland, (LU), 2:48.29. 3, Julian Johnson, (WI), 2:50.17. 4, Carter McLain, (BL), 2:52.86. 5, Luke Davis, (MD), 2:53.09. 6, Shawn Cross, (MW), 2:53.11. 4x100 Relay - 1, Lubeck (Isaac Osborn, Wyatt Curfman, Ian Osborn, Branson Hall), 1:03.89. 2, Mineral Wells (Austin Conley, Bryce Smedley, Conner Roberts, Austin Perry), 1:04.25. 3, Williamstown (Julian Johnson, Rowan Cumberledge, Carson Hill, Carter Montgomery), 1:04.27. 4, Neale (Christian Rutherford, Chaz Elam, Andrew Rickman, Hyland Garvey), 1:04.81. 5, Emerson (Quinton Wright, Jacob Thomas, Ethan DelaCruz, Carson Brundige), 1:05.34. 6, Gihon (Devin Forshey, Jordan Foster, Cam Fallon, T.J. Thomas), 1:05.81. Standing Jump - 1, Zane Lewis, (KA), 6-11.25. 2, Ty Street, (EM), 6-06.75. 3, Austin Conley, (MW), 6-06. 4, Jackson Wharton, (GR), 6-05.50. 5, Christian Rutherford, (NE), 6-04.25. 6, Ethan Fox, (JE), 6-03.75. Softball - 1, Ashton Burr, (MW), 158-08. 2, Aiden Cremeans, (MD), 136-06. 3, T.J. Thomas, (GI), 135-11. 4, Logan Fling, (LU), 127-11. 5, Jayden Bryant, (WI), 125-10. 6, Noah Frazier, (VI), 124-09. Combined Team Scores – 1) Neale 56, Mineral Wells 51, 3) Williamstown 34, 4) Jefferson 32, 5) Kanawha 28.5, 6) Lubeck 28, 7) Waverly 26, 8) Blennerhassett 25, 9) Vienna 24, 10) Gihon 17, 11) Worthington and Criss 16, 13) Greenmont 14, 14) Emerson 13.5, 15) Madison 12, 16) McKinley 5, 17) Martin 4, 18) North Christian 1. 100 - 1, Makenna Keefer, (VI), 14.10. 2, Daysha Hastings, (JE), 14.45. 3, Ava VanDyke, (BL), 14.51. 4, Kearsten Alfred, (WO), 14.58. 5, Lilly Latham, (MD), 15.19. 6, Jordan Adams, (MC), 15.25. 400 - 1, Shelby Smith, (WA), 1:09.19. 2, Bryce Smith, (WO), 1:12.51. 3, Katie Rutherford, (NE), 1:14.56. 4, Jadyn Colgrove, (VI), 1:14.80. 5, Addison White, (LU), 1:16.89. 6, Rylie Stull, (KA), 1:17.72. 4x100 Relay - 1, Jefferson (Daysha Hastings, Kaelynn Hester, Katherine Woisenski, Anyiah Spencer), 1:02.53. 2, Vienna (Leila Noland, Abigail Lynch, Izzie Blair, Makenna Keefer), 1:05.23. 3, Kanawha (Jaclynne Welch, Aleeta Ntow, Rylie Stull, Akira Edison), 1:06.19. 4, Worthington (Kearsten Alfred, McKenna Greer, Laken Collins, Maddison Kincaid), 1:06.34. 5, Williamstown (Alyssa Sauro, Lexi Wynn, Ava Lightfritz, Sydney Anderson), 1:06.36. 6, McKinley (Jordan Adams, Suzie Lyons, Sophia Beam, Annie Collins), 1:06.75. Standing Jump - 1, Ava VanDyke, (BL), 7-03.25. 2, Addison White, (LU), 6-11.50. 3, Akira Edison, (KA), 6-09. 4, Shelby Smith, (WA), J6-09. 5, Cali Way, (MD), 6-06. 6, Kailynn Walker, (GI), 6-04.75. Softball Throw - 1, Jillian Nay, (NE), 141-01. 2, Payton Mackey, (GI), 110-01. 3, Alison Marcum, (CR), 109-09. 4, Natalie Jones, (GR), 105-01. 5, Shelby Smith, (WA), 102-03. 6, Brooklin Whitehead, (BL), 100-00. 50 Preliminaries - 1, Lauren Flanagan, (EM), 7.90q. 2, Aislin White, (MD), 8.18q. 3, Brailynn Miller, (MC), 8.27q. 4, Ashley Reaser, (KA), 8.32q. 5, Camille Tatterson, (GR), 8.38q. 6, Alivia Goff, (LU), 8.40q. 7, BayleeBostaph (VI) 8.47q. 8, Saige Ashcroft (NE) 8.56q. 100 – Third heat of qualifying will be run at 5:30 on second day due to timing malfunction. First and second heat times will stand. Runners in that third heat are: Katelyn Thorn of Vienna, Olivia Eakle of Greenmont, Emma Miller of Emerson, Jayda Wright of Jefferson, Auner Joyce of Mineral Wells, Chloe Mulligan of Madison and Azzerayah Skiles of Worthington. 400 - 1, Lexi McKinney, (MW), 1:22.60. 2, Amiya Powell, (BL), 1:24.73. 3, Adilynn Deuley, (NE), 1:25.81. 4, Kayla Marlow, (EM), 1:26.36. 5, Gracie Montgomery, (WI), 1:26.50. 6, Taylor Benear, (GI), 1:27.22. 4x100 Relay - 1, Mineral Wells (Auyner Joyce, Mary Stout, Lexi McKinney, Reagan Ward), 1:07.53. 2, Jefferson (Karma Hedges, Jayda Wright, Lakin Barker, Shyanne Polan), 1:08.31. 3, Williamstown (Gracie Montgomery, Kaylyn Emigh, Correl Reck, Makaela Bandy), 1:11.11. 4, Emerson (Alayna Davis, Emma Miller, Audrey Wagoner, Lauren Flanagan), 1:11.32. 5, Neale (Saige Ashcroft, Adilynn Deuley, Lillian Inghram, Gracie Duncan,), 1:11.38. 6, Gihon (Abby Starkey, Alyssa Vanfossen, Izzy Deguzman, Addy Fluharty), 1:11.42. Standing Jump - 1, Mary Stout, (MW), 6-05.25. 2, Mya Baruwa, (NE), 6-02. 3, Izzy Deguzman, (GI), 6-01.75. 4, Olivia Eakle, (GR), 5-10.25. 5, Allison Curfman, (LU), 5-09.75. 6, Baylee Bostaph, (VI), 5-08. Softball Throw - 1, Allison Asbury, (MW), 106-07. 2, Jordyn Gains, (WI), 76-10. 3, Kendall Kimes, (GR), 69-01. 4, Ashley Reaser, (KA), 68-03. 5, Aubrey Welch, (MD), 65-07. 6, Katelyn Thorn, (VI), 64-10. 100 - 1, Jackson Kerr, (WA), 14.22. 2, Andrew Rickman, (NE), 14.25. 3, Logan Poling, (CR), 14.33. 4, Aiden Cremeans, (MD), 14.55. 5, Quinton Wright, (EM), 14.91. 5, Zane Lewis, (KA), 14.91. 400 - 1, Zach Farnsworth, (KA), 1:10.19. 2, Carson Hill, (WI), 1:10.22. 3, Christian Rutherford, (NE), 1:14.75. 4, Sylas Cheuvront, (EM), 1:14.94. 5, Noah Dulaney, (LU), 1:16.67. 6, Brynton Burkey, (MC), 1:17.63. 50 Preliminaries - 1, Xavier St. Andry, (MW), 7.84q. 2, Brayden Thorn, (VI), 7.93q. 3, Chandler Jackson, (GR), 8.06q. 4, Ben Chichester, (NE), 8.09q. 5, Izaac Nazelrod, (BL), 8.18q. 5, Trent Lawrentz, (NC), 8.18q. 7, Jaxon Thomas (MC) 8.19q. 8, Tyler Newlon (WI) 8.19q. 100 - 1, Chase Offenberger, (MW), 15.25. 2, Craig Deem, (LU), 15.67. 3, Andrew Whipkey, (JE), 15.84. 4, Jacobi White, (CR), 15.88. 5, Jaxon Thomas, (MC), 16.02. 6, Hayden Tunnell, (NC), 16.13. 400 - 1, Landen Deuley, (NE), 1:14.03. 2, Wyatt Powell, (WI), 1:15.22. 3, Kieran Daniel, (LU), 1:20.88. 4, Cole Smith, (MR), 1:22.06. 5, Dominic Way, (MD), 1:22.66. 6, Peyton Cline, (MW), 1:22.69. 50 - 1, Grace Montgomery, 8.73. 2, Abby Starkey, 8.95. 3, Chloe Daggett, 9.07. 4, Braelyn Miller, 9.30. 5, Millicent Fleak, 9.46. 6, Katelyn Carroll, 9.52. 100 - 1, Alyssa VanFossen, 17.02. 2, Olivia Eakle, 17.44. 3, Karma Hedges, 17.81. 4, Braelyn Miller, 18.61. 5, Makaela Bandy, 18.65. 6, Adrienne Kerr, 18.71. 200 - 1, Karma Hedges, 35.15. 2, Alyssa VanFossen, 35.41. 3, Olivia Eakle, 35.78. 4, Zoey Bunner, 36.80. 5, Adrienne Kerr, 37.81. 6, Corell Reck, 37.89. 400 - 1, Zoey Bunner, 1:29.76. 2, Emma Stanley, 1:37.50. 3, Taylor Gray, 2:22.79. Standing Jump - 1, Corell Reck, 5-07. 2, Olivia Eakle, 5-03. 3, Kara Parsons, 5-02.50. 4, Lily Sundstrom, 5-01.50. 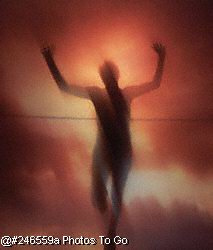 5, Allison Curfman, 5-01. 6, Braelyn Miller, 4-07.75. Softball Throw - 1, Jordyn Gains, 78-08. 2, Abby Starkey, 59-02. 3, Kaylyn Emigh, 57-05. 4, Alyssa VanFossen, 56-08. 5, Adrienne Kerr, 47-06. 6, Aubrianna Fink, 41-09. 4x100 Relay – 1, Williamstown (Kaylyn Emigh, Makaela Bandy, Grace Montgomery, Corell Reck ) 1:11.93. 100 - 1, Daysha Hastings, 15.25. 2, Gabriella Seese, (WI), 15.53. 3, Kaelynn Hester, 15.56. 4, Cayden Blankenship, 15.74. 5, Kayley Bixman, 15.94. 6, Leila Noland, 16.11. 200 - 1, Makenna Keefer, 31.34. 2, Suzie Lyons, 32.48. 3, Daysha Hastings, 32.57. 4, Jordyn Adams, 33.02. 5, Olivia Shawver, 34.58. 6, Samantha Varner, 35.15. 400 - 1, Suzie Lyons, 1:18.60. 2, Emilee Moyers, 1:21.17. 3, Alexis Wynn, 1:22.93. 4, Jordyn Adams, 1:25.90. 5, Levy Atkinson, 1:29.87. 6, Mariska Thomas, 1:32.52. 800 - 1, Alyssa Sauro, 3:05.07. 2, Kailynn Walker, 3:11.72. 3, Sydney Anderson, 3:13.13. 4, Daphne Cockerham, (WI), 3:22.59. 5, Johnessa Crouch, 3:29.56. 6, Destiny Gray, 3:38.26. 4x100 Relay - 1, Vienna (Jayden Colgrove, Makenna Keefer, Izzy King, Leila Noland), 1:03.40. 2, Williamstown Middle School (Sydney Anderson, Ava Lightfritz, Alyssa Sauro, Alexis Wynn), 1:07.09. 3, Williamstown (Remy Lefebvre , Daphne Cockerham , Gabriella Seese , Izzy Zide ), 1:09.93. 4, Gihon (Xiann James , Abby Starkey , Alyse VanFossen , Kailynn Walker ), 1:10.47. Standing Jump - 1, Sydney Anderson, 5-10.50. 2, Kayley Bixman, 5-10. 3, Kailynn Walker, 5-08.50. 4, Isabella King, 5-07.50. 5, Daniell Johnson, 5-07.25. 6, Jordyn Adams, 5-07. Softball Throw - 1, Amelia Davis, 110-11. 2, Emma Kiger, 105-10. 3, Rae Rupert, 93-10. 4, Ava Lightfritz, 91-05. 5, Roxie Sprague, 90-04. 6, Avery Barton, 78-03. 50 - 1, Coleton Hill, 8.45. 2, Jordan Dearth, 8.71. 3, Kellen Cress, 8.93. 4, Cameron Hemingway, 8.96. 5, Jordan Hess, 9.04. 6, McKendrick Allman, 9.16. 100 - 1, Craig Deem, 15.75. 2, Chase White, 16.76. 3, McKendrick Allman, 16.98. 4, Chase Giobel, 17.28. 5, Dylan Pucella, 17.47. 6, Kellen Cress, 17.69. 200 - 1, Craig Deem, 34.00. 2, Andrew Whipkey, 34.85. 3, Lyndyn Ervin, 36.37. 4, Seth Cronin, 36.60. 5, Seita Tooyama, 38.50. 6, Alijah Andrews, 45.57. 400 - 1, Jordan Dearth, 1:19.54. 2, Lyndyn Ervin, 1:21.08. 3, Coleton Hill, 1:22.70. 4, Zander Boyce, 1:23.19. 5, Seth Cronin, 1:24.39. 6, Connor George, 1:35.97. 4x100 Relay – 1,Williamstown (Dylan Pucella, Brenden Westbrook, Zander Boyce, Chase Giobel) 1:12.11. Softball Throw - 1, Chase White, 98-07. 2, Jordan Hess, 92-08. 3, Andrew Whipkey, 87-00. 4, Alijah Andrews, 86-00. 5, Connor George, 81-11. 6, Cooper Sams, 76-04. Standing Jump - 1, Coleton Hill, 5-06. 2, Craig Deem, 5-04. 3, Jordan Dearth, 5-01. 4, Cooper Sams, J5-01. 5, Connor George, 4-09. 6, Kellen Cress, J4-09. 100 - 1, Jackson Kerr, 15.33. 2, Brynton Burkey, 15.94. 3, James Hutson, 16.05. 4, Carter Montgomery, 16.31. 4, Wyatt Curfman, 16.31. 6, John Wilkinson, 16.43. 200 - 1, Ian Osborn, 32.90. 2, Austin Conley, 33.15. 3, Isaac Osborn, 33.93. 4, Jayden Flinn, 34.10. 5, James Hutson, 34.49. 6, Chance Kirgis, 34.79. 400 - 1, Braycon Hedges, 1:11.28. 2, Jackson Kerr, 1:14.05. 3, Brynton Burkey, 1:17.36. 4, Aeneas Lauderman, 1:17.62. 5, Cayden Blankenship, 1:27.89. 6, Isaac Osborn, 1:30.45. 800 - 1, Jayden Dearth, 3:09.24. 2, Ian Osborn, 3:19.72. 4x100 Relay – 1, Jefferson ( John Wilkinson, Connor Roberts, Brayden Arthur, Cayden Blankenship) 1:08.00. Standing Jump - 1, Austin Conley, 6-02. 2, Carter Montgomery, 5-10. 3, Wyatt Curfman, 5-09. 4, Chance Kirgis, 5-08. 5, John Wilkinson, J5-08. 6, Connor Roberts, 5-05. Softball Throw - 1, Gunner Loscar, 109-02. 2, Jackson Kerr, 108-02. 3, Skylar Hutchinson, 102-00. 4, Ian Osborn, 99-05. 5, Jeramiah Loscar, 99-02. 6, Thor McLaughlin, 98-01. Girls 1600 - 1, Brianna Winsett, 6:44.84. Girls 200 - 1, Brookelyn Reynolds, 29.02. 2, Destyni Hastings, 29.71. Boys 200 - 1, Josh Hutson, 37.55. Girls 100 - 1, Brookelyn Reynolds, 13.80. 2, Destyni Hastings, 14.15. Boys 100 - 1, Austyn Ervin, 16.85. 2, Josh Hutson, 17.79. Girls 800 - 1, Brianna Winsett, 2:54.07. Boys Softball Throw - 1, Austyn Ervin, 110-03. 2, Josh Hutson, 107-03. Boys Standing Jump - 1, Austyn Ervin, 5-4.